We’re living in the midst of the age of information, a time when online data analysis can determine the direction and cement the success of a business or a startup that decides to dig deeper into consumer behavior insights. In the digital age, knowing your customers on a more personal level is the most effective way of developing marketing communications, customer service reports or initiatives that offer genuine value and yield real results. By managing customer data the right way, you stand to reap incredible rewards. Exclusive Bonus Content: Your effective, bite-sized cheat sheet on CDM! Download right here your quick summary of the customers’ data world! With multiple big data cloud solutions already established in today’s market, it’s possible to use our own customer database(s) to analyze and measure the behavioral patterns, interests, demographic details, specific customer service KPIs, and any additional domestic information that our customers might have shared with us across various touchpoints. This consumer-centric information, if well-managed, can form the building block of a business’s long-term success. By gaining a deeper understanding of our customers’ individual personalities, pain points, and preferences, we can cater to their needs on a far more personal level – which is essential in today’s ultra-competitive digital business environment. Customer data management is the key to sustainable commercial success. 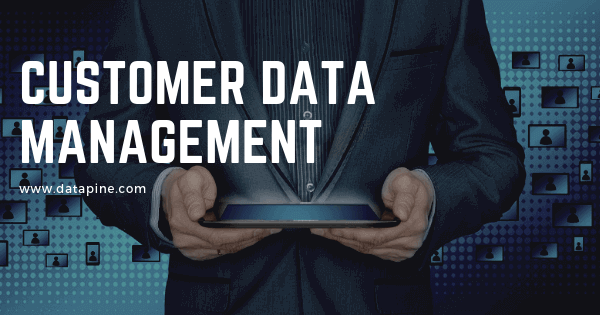 Here, we’ll explore customer data management, offering a host of practical tips to help you embrace the power of customer data management software the right way. 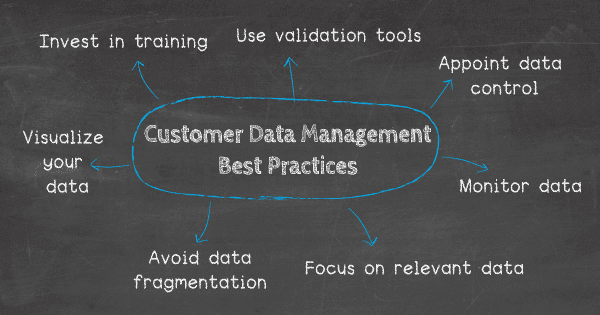 What Is Customer Data Management (CDM)? Customer data management (CDM) is the process of collecting, analyzing, and managing your business’ customer data while solving your customers’ specific problems and provide valuable solutions to their issues while maintaining a superior level of customer satisfaction. By delivering products, services, solutions, and content that offer real value to your audience, you stand to increase customer retention levels, improve brand awareness, and boost your bottom line. Centered on leveraging consumer insights to improve your strategies and communications by using a highly data-driven process can also be referred to as Customer Intelligence (CI). If you wish to attract and retain your customers, it’s critical to gain a clear understanding of your customer. Adopting a CI-driven mindset is essential. The ability to visualize real-time market changes. Improving the ROI of your promotional and marketing activities. Developing more relatable, sustainable customer-driven business strategies. 95% of senior executives feel that data is a pivotal part of their business strategy development process. A testament to the potential of client data management. A moderate increase in Customer Experience (CX) driven by improved client data management generates an average revenue boost of $823 million over three years for a business with $1 billion in annual revenues. 53% of millennial consumers feel that store associates don’t have the tools they need to deliver excellent customer service initiatives like mobile devices for looking up shopper profiles and providing product recommendations. By managing customer data more efficiently, you will be able to improve your business’s customer-driven activities, both online and offline. A recent study discovered that 49% of marketers utilize data to enhance the customer experience. It’s clear that effective customer data management has the potential to maximize your business’s potential in a number of ways. To help steer your ongoing success, here are 7 customer data management best practices for your reading pleasure. An employee that actively applies data analysis practices to their work can be as much as ten times more productive than someone with little or no practical experience in data analysis. The pivotal element that sets an experienced data analyst apart from a novice is the ability to understand the concept data on a comprehensive level, including the creation of a complete analytical report. This understanding yields a wealth of new resources and insights that can be used to enrich the business’s overall data-centric strategies. Invest in training for your business and IT staff – with their buy-in (and newfound skills), you’ll be able to conduct truly effective data management. Smaller businesses should also consider the wealth of economical training options available today. The Internet makes it entirely possible to learn analysis through data analysis books and online courses, many of which are accessible at a low cost or free. Customer databases consist of millions of records, and each customer is equipped with their own address details, such as the zip code and other invaluable information. Records that fail to include this level of data can cause real problems in the communication process. When this situation occurs, address verification or validation tools can become incredibly useful – and it’s possible to integrate them with almost any leading verification software with popular CRM or ERM systems. Concerning client database management, your analysis should be divided into departments where only a handful of people have full administrative privileges. Unless you take the necessary precautions, you run the risk of having to deal with multiple non-common data entries that may make your stats, facts, figures, and metrics inconsistent. A good example would be acronyms for countries – you may input ‘US’ into your system, but someone else might have inserted ‘United States’. Such inconsistencies can have a huge effect on the way data is organized through a host of different management systems within a company. The best way to tackle this problem is to assign a special customer management group that knows all the necessary rules that govern your internal customer data creation. With the help of a decision support software, you may also expand this further into departments so that everyone is up-to-date on the right approach to customer data management. Customer data is a state of constant flux, which is the number one reason to employ solid data monitoring principles. You may want to use specific notification techniques to maintain overall data quality and establish specific security policies that keep data organized and on point. A bi-weekly scan of incomplete or erroneous records is essential to keep your database fully optimized and updated. Moreover, twice a week, you should also check your data for any unnecessary records and entries that should be cleaned – an essential component of client database management success. An online report generator can decrease the amount of time needed for these kinds of tasks and increase the quality of the data monitoring processes. With concrete data monitoring principles, you are well prepared to get all your key metrics out of your data with a smart KPI software like datapine. It’s easy to get sidetracked with customer data management and optimize the particular CRM system in such a way that every available source of data is being tracked constantly. But sometimes, you will only need the very surface of all our available consumer data to make the most sound decisions for your company. It can be overwhelming for anyone in the sales department to come across a plethora of data choices when the only thing that’s really necessary is the understanding of which particular data set is most important for the business at any given time. To avoid these ‘data overload’ roadblocks, focus on implementing your sales report methods in a way that strives for better informational quality over data quantity – a priceless customer data management strategy. When it comes to customer data management strategy, in addition to selecting your consumer data wisely (mining for quality over quantity), implementing a cohesive information collection process is essential. While you might get the vast majority of your customer insights from a small handful of tools, platforms, or sources, without the ability to view, interact, and analyze with your data from one central location, your information could become fragmented, making it less effective. It’s worth investing in customer data management software that allows you to collect, curate, and drill down into your consumer insights from one central location or live dashboard. That way, you will ensure cohesion and fluidity as well as a full and reliable view of the information that is most valuable to your business. 90% of the information transmitted to our brains is visual. Moreover, those who follow directions with illustrations thrive 323% more than people who follow text-only directions. By visualizing your customer data with the help of an online data visualization tool, aiming of using it to drill home an important set of insights or tell a story, you will make this all-important information widely accessible across the business. If people can understand the data before them because it’s more visually digestible, they will be able to develop initiatives that will ultimately enhance the level of customer experience you offer your audience, resulting in increased commercial success. To put the power of data visualization into a real-world perspective, here are some data visualization examples that you need to explore. By leveraging the right customer database management system for your organization, you will be able to improve your marketing communications, sales initiatives, and customer experience efforts. While we’re on the subject, here are two examples of customer data management software dashboards based on marketing and service. 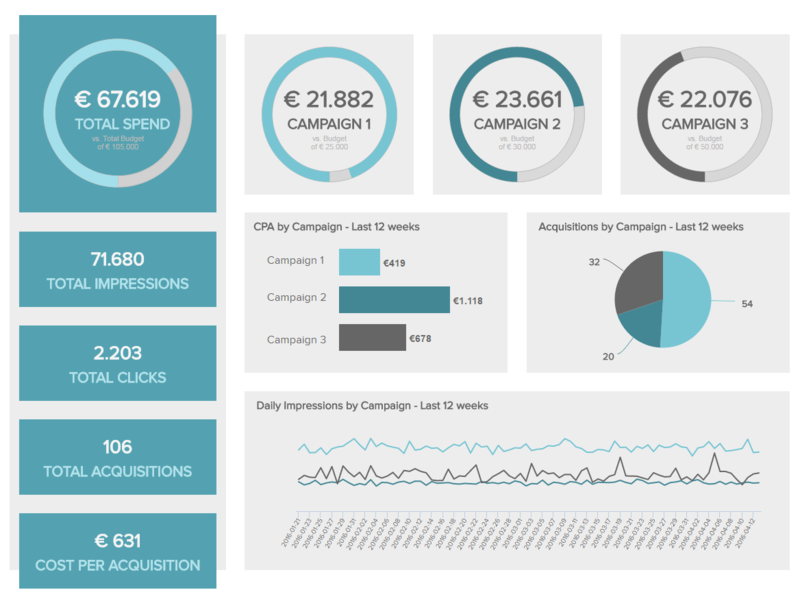 A working example of customer data management software (or customer data management system) in action, our marketing dashboard template hones in on the key areas of your customer-driven strategies and promotions with a view of making them more valuable, effective, and economically efficient. By offering a digestible snapshot of marketing KPIs including CTR, CPC, and CPA, you will be able to sharpen your marketing initiatives to make them more economically viable as well as identify any weaknesses to touchpoints such as your website and landing pages to make your communications more engaging, inspiring, and results-driven. There’s no doubt about it: customer satisfaction is one of the most important elements of ongoing business success. Keeping your customers happy and engaged is the best way to foster brand loyalty and grow your audience over time. Our customer service dashboard will help you do just that. With a mix of KPIs that help to monitor, measure, and analyze the success of your consumer-centric efforts in a host of areas, this client database management dashboard (or customer data management system) will help you boost your brand reputation, increase your customer retention rates, and grow your profitability indefinitely. Although as a digitally transformed species, we’ve come an incredibly long way in recent years, we’re still on a big learning curve concerning the analysis of key consumer metrics and the best customer data management strategy. Customer data management is continually evolving, so we have to work with our current capabilities to avoid the mistakes that could cost us our budget, and most importantly – our customers. But by following the customer data management best practices, working with the right customer database management system for your organization, and using this wealth of invaluable insights to your advantage, you will be able to reach out and connect with your audience on a deeper, more meaningful level than you ever thought possible – and that, modern business warrior, is priceless. Are you looking for more consumer-centric wisdom? Try our software for a 14-day trial, completely free!